This book covers the application of psychological principles and techniques to situations and problems of aviation. It offers an overview of the role psychology plays in aviation, system design, selection and training of pilots, characteristics of pilots, safety, and passenger behavior. It covers concepts of psychological research and data analysis and shows how these tools are used in the development of new psychological knowledge. The new edition offers material on physiological effects on pilot performance, a new chapter on aviation physiology, more material on fatigue, safety culture, mental health and safety, as well as practical examples and exercises after each chapter. "This unique and highly practical book should be the primary reference for students of aviation psychology seeking to gain an understanding of the principles and techniques of psychology applied to aviation. It will also be of interest to pilots and others who work professionally in aviation to gain insight into how much in modern psychology is applied to support safe flight operations. The new sections on aviation physiology and abilities and personality are excellent and further enhance the readability and usefulness of this text. The authors are leading figures in this field have presented a fascinating and highly readable textbook." "A new way of looking at the subjects of aviation psychology and human factors, this approach will be very useful in aviation psychology training especially for non-psychologists. The book gives a comprehensive coverage of all topics in the field. It has been written in an easy to understand manner and will certainly useful for pilots who want to understand more on the subject. Overall a must have book for aviation psychologists (to understand how psychology is applied in aviation) and human factors specialists (to understand basic psychological principles, processes and models in aviation)." "The introduction gives an excellent overview of aviation psychology and presents its key models and constructs. Basic concepts, research methods and statistics are clearly explained, and vividly illustrated with practical examples from the aviation domain. A must read for aviation professionals for understanding the human part of the fascinating aviation system. Very well researched and enjoyable to read, this is the reference book for academic teaching and practical instruction in aviation psychology and human factors, as it addresses all basic concepts and current topics." "The book is a very thorough and up to date as can be introduction to aviation psychology and human factors, their benefits and practical implications, and a very enjoyable read at the same time. 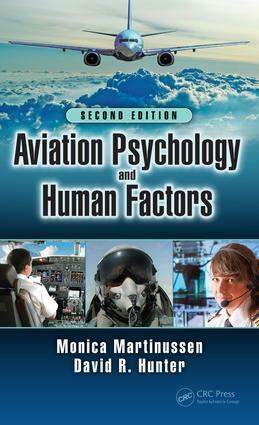 As the overall goal of the book is to make pilots and other students of aviation aware of psychology and human factors, to provide them useful information to apply in their daily work, and to make them informed consumers of future psychological research and studies, this book may serve as a very effective tool to that end." Introduction. Research Methods and Statistics. Aviation Physiology. Abilities and Personality Traits. Personnel Selection. Training. Human Factors and the Design of Aviation Systems. Stress and Human Reactions. Culture, Organizations and Leadership. Aeronautical Decision-Making. Aviation Safety. Concluding Remarks. Dr. Monica Martinussen is a licensed psychologist and currently Professor of Psychology in the Regional Center for Child and Adolescent Mental Health at the UiT Arctic University of Norway and Professor II at the Norwegian Defence University College. Dr. Martinussen conducted her doctoral research in the area of pilot selection, and has been engaged in research on that topic for many years, both for the Norwegian Air Force and at the University of Tromsø. Her research interests include research methods and psychometrics, aviation psychology, mental health, and work- and organizational-psychology. Dr. Martinussen has been a member of the Board of Directors of the European Association of Aviation Psychology for eight years, and is currently Associate Editor of the journal Aviation Psychology and Applied Human Factors. Dr. David Hunter has over 30 years of experience as an aviation psychologist. He is a former military helicopter pilot with combat experience in South East Asia, and holds a commercial pilot license for both fixed-wing aircraft and helicopters. Dr. Hunter has conducted research on the use of computer-based tests for the selection of pilots for both the US Air Force and the UK Royal Air Force, and has served as an advisor for the human factors design of new aviation systems for the US Army. He also served as the Principal Scientist for Human Performance with the Federal Aviation Administration, where he conducted research and managed programs to improve safety among general aviation pilots. He is currently an independent consultant with a practice in Phoenix, Arizona.